What: Navigator for ArcGIS is a navigation app that can be used out of the box or with your custom data. It can be fully integrated with other ArcGIS apps and works in a disconnected environment. When: The app will be available for iOS devices this month, Android devices in late 2015, and Windows devices in 2016. How to get it: You will need an ArcGIS Online account plus an additional annual subscription for Navigator for ArcGIS. Nearly ubiquitous, smartphones shape the way we live and work—including how we get where we are going. We often follow voice-guided, turn-by-turn directions on smartphones and other devices rather than consult a paper map. But if you work in a government agency such as public works or the fire department, in oil and gas, forestry, utilities, transportation, or logistics, you need more than a consumer navigation solution that gets you from point A to point B.
Esri's new Navigator for ArcGIS can steer you directly to your organization's assets. 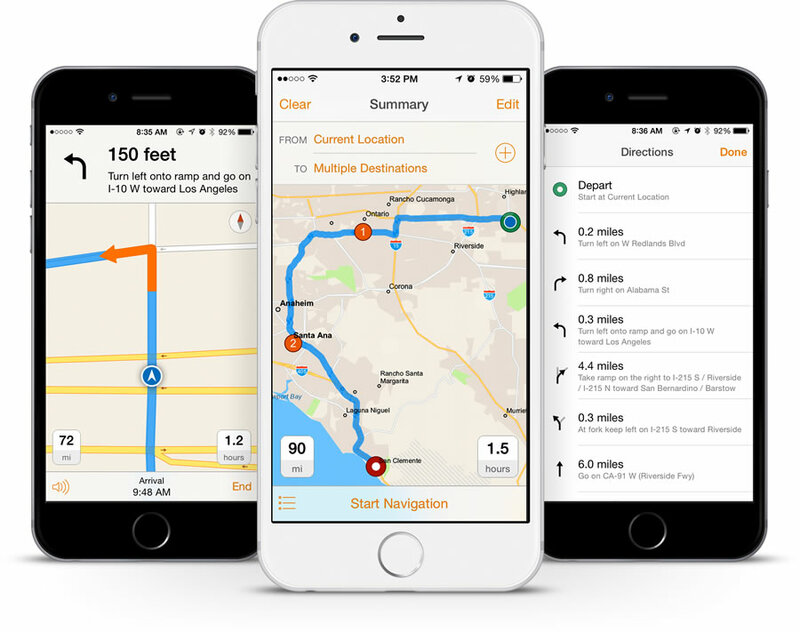 Esri's new Navigator for ArcGIS app, which runs on all types of devices from smartphones to ruggedized tablets, is a navigation app that routes you where you need to go and supports an array of commercial workflows. You can use the app to help you conduct inspections in the field, navigate to assets that are off the commercial street network, or fulfill local parcel pickups and deliveries. Navigator for ArcGIS brings in your organization's data, such as the location of assets and your own noncommercial road networks, and fully integrates with other ArcGIS apps or your own apps—all on one device. The app works even if you have no network connectivity, sends you to the exact location of an asset, and provides the best possible routes to your work locations based on factors that consumer routing apps do not consider. The app includes commercial street data for the world, which your organization can enhance or replace with custom street network data. Service technicians and other field workers will be able to navigate street networks not available from any commercial data vendor—especially useful when managing assets such as oil wells, forest stands, and utility poles around the world. Taking the best possible route saves your organization money by reducing mileage and travel time. Navigator for ArcGIS supports travel modes. Travel modes define what road rules and settings you want to apply. You can choose among modes such as drive time; drive distance; walk; truck distance; rural driving time; and rural driving distance. Less time on the road means more time spent by workers performing their duties in the field. And drivers can focus on driving rather than pulling out paper maps to navigate, so safety will increase as traffic accident risks decrease. 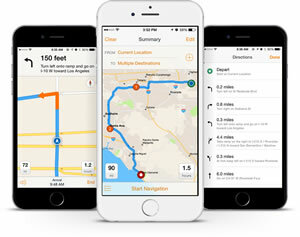 By using maps in Navigator for ArcGIS, workers in the field can access directions anytime, even when disconnected from Wi-Fi or Internet service. And they can do this from a device they probably already have in their purse or pocket—their smartphone—instead of carrying along a second device for GPS. Search and visualize your organization's own asset and location data. For example, instead of driving to a neighborhood and looking around for a particular fire hydrant, firefighters can simply search "Fire Hydrant 126" to be directed to its precise location. Turn on vehicle mode in the app. You can specify what type of vehicle you are driving—truck, car, vehicle for rural access roads, or even an emergency vehicle. Navigator for ArcGIS will calculate the most efficient route depending on the vehicle's road capability, height and weight, and curb-approach guidelines. Use with other ArcGIS apps such as Collector for ArcGIS. Switch seamlessly between the apps depending on whether you are, for example, navigating to your next stop or collecting data. Send stops to Navigator for ArcGIS directly from other business apps that contain tasks and plan ahead by creating a work list of all stops for the day. Navigator for ArcGIS will help you and your field crews reduce time windows, be more punctual, and minimize missed appointments. These operational improvements will, in turn, build greater trust with clients and boost customer confidence.